The muzzle of mk2 is threaded, but 9mm doesn’t really need a flash hider. So I added a linear compensator aka noise re-direction device. Works very well: the report becomes a lot less noticeable, especially with subsonic ammunition which doesn’t produce a secondary shockwave. Accuracy observation: 100-147gr ammunition works well. 75gr or 158gr don’t, and neither do 50gr hypervelocity arounds. Lighter bullets show the best velocity gain, which means 100-110gr are probably optimal for the combination of accuracy, terminal effect and lighter felt recoil. This entry was posted in rifle, weapon and tagged 9x19, EOTech, keltec. Bookmark the permalink. I’ve always found the overall flimsy feel and cheap appearing front sight of the KT SU2K offsetting. Still its beginning to appeal to me as a HDW or recreational carbine. Mark 2 has a metal front sight tower that takes AR15 sight posts. Did they change how the muzzle was threaded? I thought that using the threads required the front sight to be removed. Mark 2 comes with a threaded muzzle. 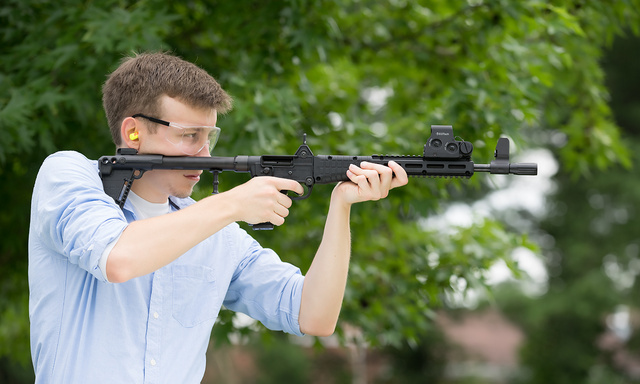 Yeah, but I thought the threads were under the front sight, and to use them the front sight had to be removed? This is a very welcome change. 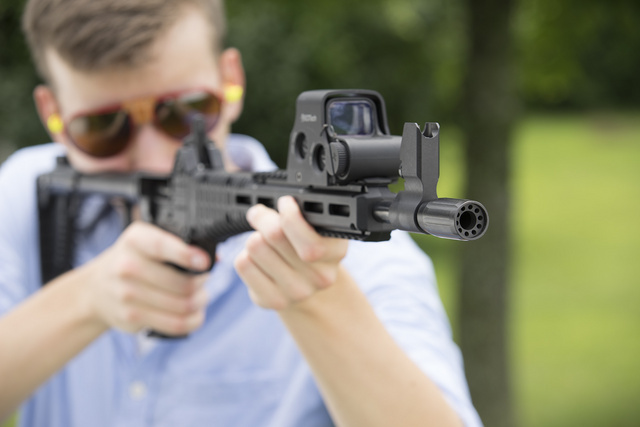 http://olegvolk.net/gallery/technology/arms/keltec/sub2000mk2_front_sight_tower_2162web.jpg.html New front sight tower. Awesome, because all the video I saw coming from shot show was saying/showing that you had to remove the front sight in order to use the threads. the rail. What is the reasoning behind mounting the optic towards the muzzle? Originally, it was set forward so that it wouldn’t block the left eye’s view of close targets. As you will see in the photos coming up tomorrow, I have since re-mounted it as far back as it will go, mainly to balance out a light/laser unit cantilevered car forward to avoid occlusion of the light by the muzzle. Are the muzzle threads 1/2″x 28? If so then the can I have for my Glock would mesh nicely.